For half a century, Rudolph the Red-Nosed Reindeer® has delighted young and old alike with its enduring themes of love, friendship, acceptance and triumph over adversity. Now, Rudolph® leads Santa's reindeer once more with a sculpture honoring the holiday special's 50th anniversary. Introducing the Rudolph's Christmas Journey Sculpture, a one-of-a-kind exclusively from The Bradford Exchange. This Christmas masterpiece showcases Santa Claus in a sleigh led by Rudolph® and joined by more favorite characters like Hermey®, Sam the Snowman® and more! This lighted and musical sculpture is the perfect addition to your holiday decoration, expertly hand-cast and hand-painted in vibrant color and charming detail. 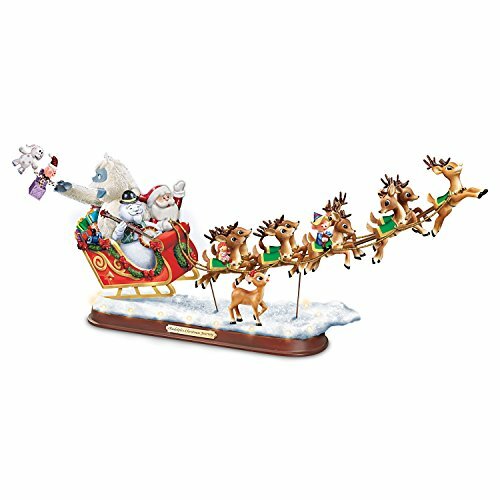 Gleaming with golden accents and glowing with 20 festive LED lights, Santa's fully sculpted, bright red sleigh includes a team of 8 reindeer plus 10 beloved characters from the holiday special. Rudolph's nose lights up too, and the melody of "Rudolph the Red-Nosed Reindeer" plays at the touch of a switch! A glittery snow-covered base with a title plaque adds the final flourish to this remarkable presentation. Given the popularity of the Rudolph the Red-Nosed Reindeer holiday special, this officially licensed sculpture is expected to draw widespread demand. The edition is limited to 120 casting days, so hurry. Order now! If you have any questions about this product by Bradford Exchange, contact us by completing and submitting the form below. If you are looking for a specif part number, please include it with your message.